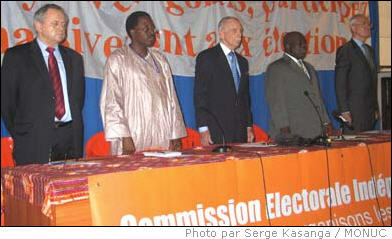 At the official launch of the DRC provincial election campaign on Friday October 6 2006, the High Authority of the Media (HAM) reiterated that the media had a very important role to play in this crucial period of the country’s history. The meeting was attended by HAM president Modeste Mutinga, the French ambassador to the DRC Bernard Prévost, William Swing, the UN special representative in the DRC, as well as representatives from UNDP and the Communité Wallonie Bruxelles. Due to lack of media funding to cover the provincial elections, HAM turned to the international community for help, and it came firstly in the form of assistance from the "Communité Wallonie Bruxelles", who donated US $40,000. This money will now be distributed to 80 media beneficiaries countrywide, who will receive US $500 each. Mr. Mutinga also welcomed the support of UNDP in the DRC, which donated US $50,000 towards the rehabilitation of their offices and equipment, which were burned down in July. “This important support will allow us to fully complete our work of sanctioning and controlling the media, so that the act of engagement for the elections is complied with, and we will continue to monitor the media until the new Congolese government is installed,” said Mr. Mutinga. UNDP representative Karunda Keita said that they recognized the important role that HAM has to play in the march towards democracy in the DRC. “We hope HAM can now complete their work so that there will be a balanced media coverage of the elections in DRC,” he added. France also contributed US $25,000 towards the financing of the media in order to have a good responsible coverage of the provincial elections, in addition to the 200 Congolese journalists already trained by French media organisations since January 2005. “We hope that all this support will help HAM in its work, so that professionalism, transparence and serenity can be assured in the coverage of the elections,” said French ambassador Bernard Prévost. William Swing, the UN Special Representative in the DRC, said that he welcomed the tenacious determination of HAM in its work, despite the difficulties of recent months. “With the events of the last few months, the role of HAM is crucial to curb the hate messages that have been disseminated by certain media. Thus with a professional media coverage, everybody can be focused and have a proper debate on socio economic election issues that are important to the Congolese people,” he said.